A new study looked at IV infusions into mice of two different human stem cell types about once a month. Scaling that to the lifespan of a human would mean infusions once every few years. The lifespan extension was an impressive 23-31%. The researchers saw better brain function and less cognitive decline. The researchers also observed that the stem cells were able to become new brain cells. The repeated infusion of stem cells also recovered reduced levels of important brain chemicals that are needed for normal brain function. The animals that received the stem cells also had better blood supply to their organs and stronger muscles. Actually the paper (which I attach) is quite interesting and the beginning explains a few things nicely of "AGING"- a big part of that is oxidative stress to your cells, similar to rusting of an iron pip. To combat that we need fat cells at a later stage of our lives. Until that time has arrived that we can do so, natural antioxidants like Astaxanthin (of which I take 9 mg a day) are well worth taking to keep the vasculature smooth and flexible. Aging brings about the progressive decline in cognitive function and physical activity, along with losses of stem cell population and function. 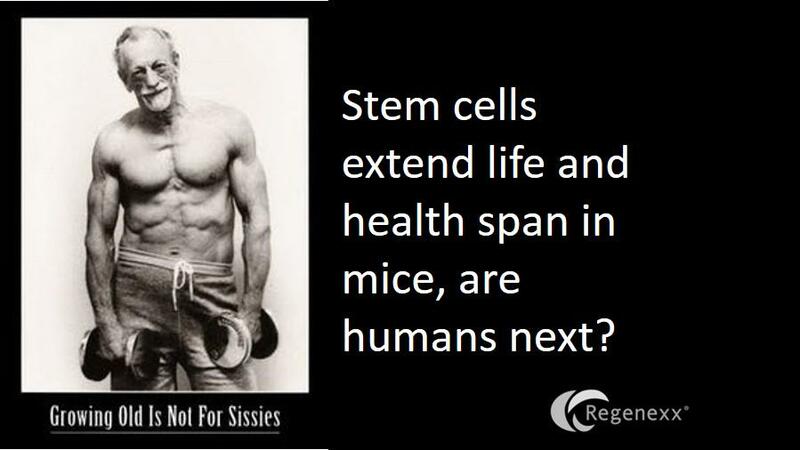 Although transplantation of muscle-derived stem/progenitor cells extended the health span and life span of progeria mice, such effects in normal animals were not confirmed. Human amniotic membrane-derived mesenchymal stem cells (AMMSCs) or adipose tissue-derived mesenchymal stem cells (ADMSCs) (1 3 106 cells per rat) were intravenously transplanted to 10-month-old male F344 rats once a month throughout their lives. Transplantation of AMMSCs and ADMSCs improved cognitive and physical functions of naturally aging rats, extending life span by 23.4% and 31.3%, respectively. The stem cell therapy increased the concentration of acetylcholine and recovered neurotrophic factors in the brain and muscles, leading to restoration of microtubule-associated protein 2, cholinergic and dopaminergic nervous systems, microvessels, muscle mass, and antioxidative capacity. The results indicate that repeated transplantation of AMMSCs and ADMSCs elongate both health span and life span, which could be a starting point for antiaging or rejuvenation effects of allogeneic or autologous stem cells with minimum immune rejection.